Being a new or expectant parent is overwhelming in countless ways. That’s why we put together this list of the best travel system strollers. We researched the top brands and best sellers for you so you have one less thing to worry about as you prepare for your new arrival. Before we get into our top picks, let’s take a look at some of the key features you should know about before you shop. Pieces: We kept it simple. All of these systems have 3 pieces and they’re the 3 pieces you need for a true travel system. You get a car seat, a car seat base for your car, and a stroller that allows the car seat to click in place. 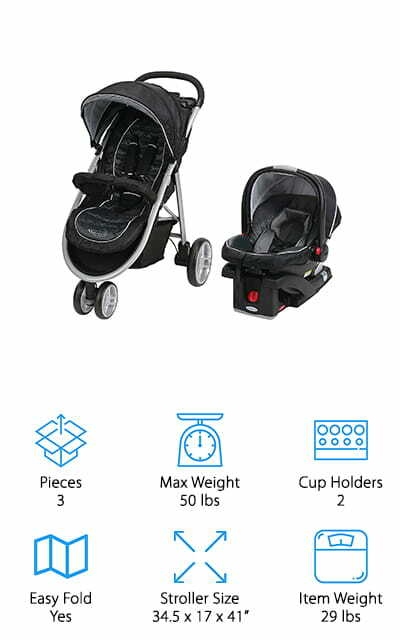 Max Weight: All of these strollers can hold up to 50 pounds, including your baby and the car seat. The car seats themselves have weight limits that vary slightly but can usually hold between 22 and 35 pounds. Cup Holders:It might seem like a little thing but cup holders are very important. Not only can you take a cold drink along with you but they also give you a place to stash your phone, keys, or an extra pacifier. Easy Fold: Being able to fold and unfold your stroller with one hand is extremely convenient. It comes in really handy when your baby is fussy or you need a hand to hold onto a toddler that likes to run off. Stroller Size: These are the dimensions of the stroller with the car seat attached. One really important reason to pay attention to size is to determine whether or not the stroller will fit in your trunk of the back of your car. Item Weight: Remember that you’re going to be lifting this system a lot and pushing it even more. Make sure to choose one that is light enough that you can easily lift it with one set of hands. Now that you know a little more about the main features of these systems, let’s move into our reviews. If you don’t have a lot of time, we got you. Our top and budget picks are at the top of the list. Whether you’re looking for the best product or the best price, it’s easy to find. All of these systems are awesome so keep reading if you can stick about. So, what is the best travel system stroller? Let’s find out. Our top pick is the Evenflo Pivot Travel System, one of the best travel system strollers if you want something that will grow with your child. On its own, the car seat can hold an infant up to 35 pounds and the stroller can hold up to 50 pounds. One of the best things about this system is how many options you have. There are 6 different modes to choose from, including 2 reverse options so you can keep a close eye on your little one while they’re still small. This is a great stroller for walking on sidewalks or running errands. The Cruiser Tires gives your child a smooth ride and the ergonomic handles help keep you comfortable while you push your child along. The best cheap stroller system is also our budget pick, the Safety 1st Travel System. The car seat has 4 different harness heights so you can get the best fit for your infant as they grown. Use the newborn supports for newborns to make sure you give them the extra support they need. This system can be used with the car seat rear-facing until the baby reaches 35 pounds. Plus, the car seat is LATCH equipped and airplane ready. The stroller can support your infant long after they’ve outgrown the car seat. In fact, you can use it until they weigh 50 pounds. That’s not all, this stroller even has an easy fold design so you don’t have to struggle getting it in and out of your car’s trunk. The Graco Aire3 is our next pick for best baby stroller travel system. This is a 3-wheeled stroller that you can fold quickly and easily using only 1 hand. It even has a carrying strap to make it even easier to transport. 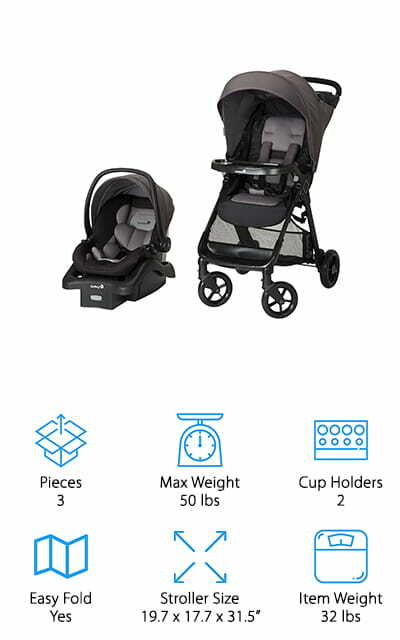 And get this, the stroller only weighs 22 pounds so it’s really easy to lift and carry from the house to the car or anywhere else you need to go. When it’s folded, it stands up on its own so you can use both hands to tend to your little one. The seat has multiple recline positions and even goes flat so your baby can nap comfortably when necessary. You’re going to love the parent tray. It has 2 cup holders and zippered storage for smaller items. For a really adorable and Disney themed best car seat stroller travel system, check out the Disney Amble Quad Travel System. This system is Minnie Mouse themed with cream and pink floral fabric and a newborn insert shaped like Minnie’s head, bow and all. The car seat fits in with one click and is safe for rear facing infants up to 22 pounds. The stroller has a 5-point harness that converts to 3-point once your baby is old enough. It’s safe up to 50 pounds so you’ll use this stroller for a long time. 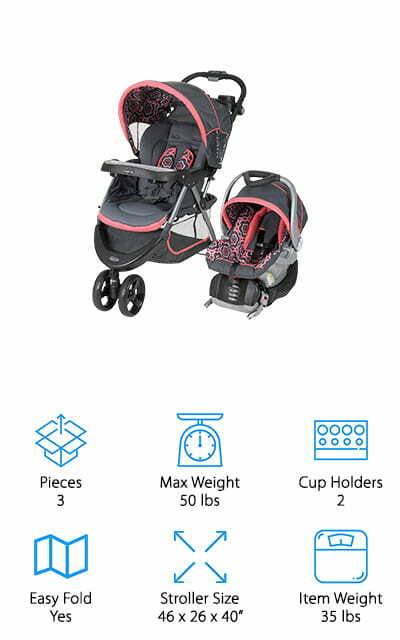 There’s a lot of room for your gear on this stroller, too, including a large stow away basket and a parent tray with a small storage area and 2 cup holders. The Chicco Viaro Stroller Travel System has a lot to offer but the thing that impressed up most is that the stroller only weighs 18 pounds. That makes it our pick for best lightweight stroller travel system. It features a convenient one-handed fold and an ultra-light aluminum frame. You won’t have any trouble getting this stroller in and out of your trunk even if you have to hold a fussy baby at the same time. The car seat easily transfers from the base to the stroller and audibly clicks into place. When you’re walking, the front wheel suspension moves easily through tight spaces while leaving your baby undisturbed. Plus, we love that you can access the storage basket from the front and back of the stroller. 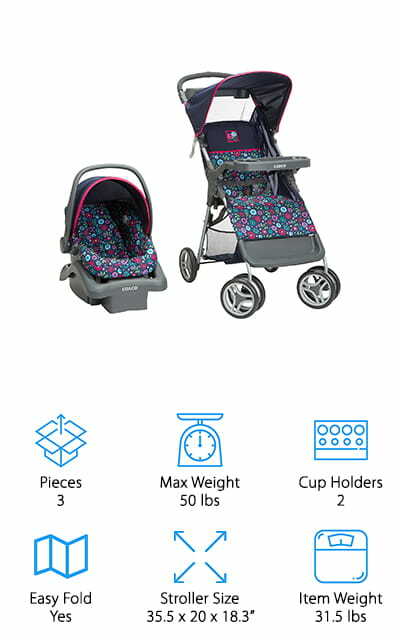 For the best rated stroller travel system that’s loaded with convenient features, take a closer look at this Britax Travel System. The B-safe car seat easily goes from base to stroller with a few simple clicks. The car seat has a steel frame and a contoured shell to give your baby the highest amount of protection possible. And get this, the base actually compresses in the event of an accident to absorb the force of impact. 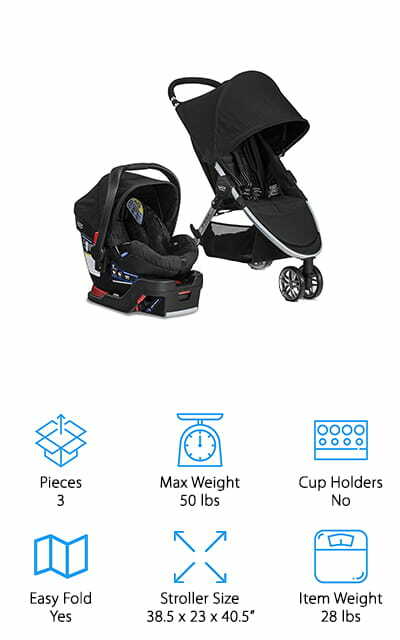 The stroller is easy to navigate and the 3-wheel system allows you to fit into tight spaces and make sharp turns quickly and easily. Plus, it has one-hand fold and a lightweight frame so you can easily carry it down your front steps and lift it into your trunk when it’s time to go. 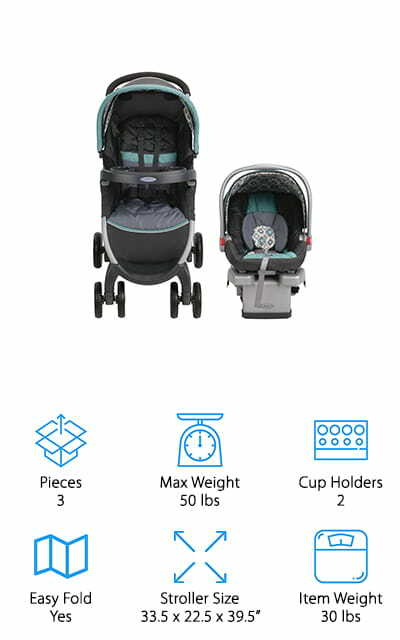 The Graco Affinia Travel System is the best stroller for sale if you’re looking for a lightweight stroller travel system that doesn’t cost a whole lot of money. The one second fold is super-convenient because it takes up next to no time at all. Plus, you can fold it with one hand so you always have an arm free for your little one. Without the car seat, the stroller weighs only 22 pounds and is the perfect size for a busy mom on the go. Your baby or toddler will love it, too, and will enjoy the multiple reclining positions while you try to keep them comfortable. This stroller can grow with your child quite a bit, too. There’s a 5-point harness that converts to a 3-point when your little one gets big enough. Next up in our stroller system reviews is the Baby Trend Nexton Travel System. This is an easy system that has all the features new parents need. Move the car seat from its base to the stroller with ease thanks to the Flex-Loc system. The stroller has a reclining seat with multiple positions to help make your little one comfortable no matter what mood they’re in. Plus, it also has an adjustable 5-point harness for maximum safety. The simple 1-handed folding mechanism is really useful and it has a 3-wheel design that maneuvers easily. Your parent tray has 2 deep cup holders and a small covered storage area for little things like keys or a wallet. And get this: the child tray is completely removable for easy clean up. 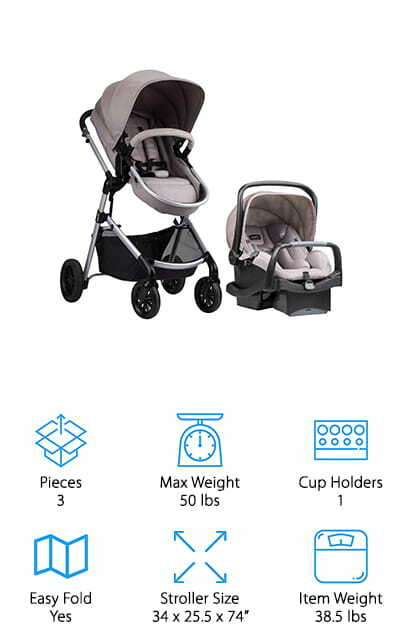 The last product in our stroller system buying guide is the Cosco Lift & Stroll Travel System. It features a car seat that can hold your little one up to 22 pounds. It has a 5-point harness with straps that easily adjust as your baby grows from a newborn. The car seat is one of the lightest available and weighs less than 7 pounds. That’s not all. 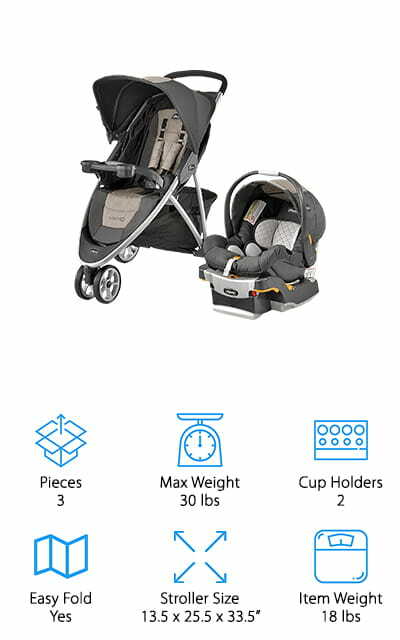 The stroller included in this system has a 3-point harness to use once your baby outgrows the car seat and can sit up unsupported. This is a simple lightweight stroller that has a 1-handed folding mechanism. It features a parent tray with 2 cup holders and a space to keep small things when you’re on the go. If you’re looking for the best jogging stroller travel system, Baby Trend’s travel system is the way to go. Because this is a jogging stroller, it was designed with 3 wheels. 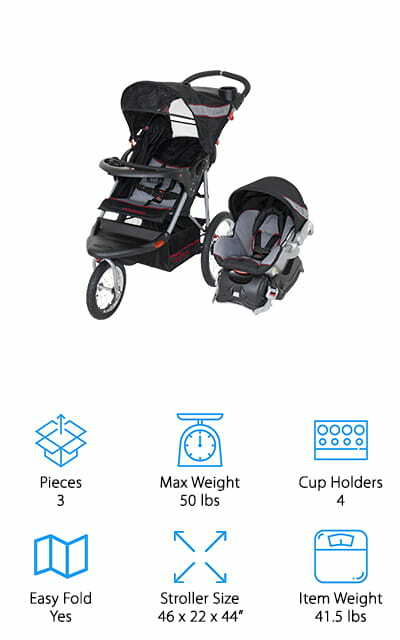 The front wheel swivels when you need to maneuver around but locks straight for when you’re taking your baby for a jog once they’re a little older and out of the car seat. Plus, the all-terrain tires can handle a little more bumps than regular tires can. 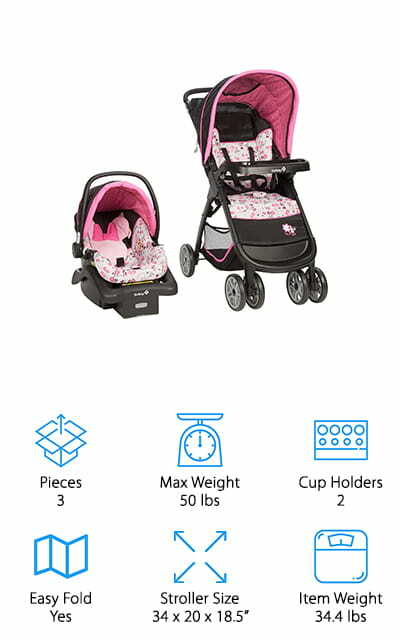 This stroller features a parent tray with 2 cup holders and covered storage. Plus, the baby gets a tray, too, with 2 cup holder. The seat reclines in multiple positions so your little one will always be comfortable riding in the best all terrain stroller travel system.